To a friend a wave is a greeting; to a traffic policeman, an order to stop; to a barber, a curl he had better protect; to the physics student, a complicated something I do not pretend to understand; to the surfer, a thrill. To a candidate in a democracy, a wave is a dream. The wave has become a trope among the many metaphors for public sentiment. Every journalist sets out in search of a wave, or writes reams in its absence. And yet no one quite grasps its essential characteristic. A wave is never visible until it nears the shore. Even a tsunami can travel a thousand miles without a splash along the way. It is the job of pundits to check seismic shifts that generate a powerful current, but you can’t see much if you keep shouting at the surface. An election date is the shore. Now that the calendar for the 17th general election is known, those without blindfolds can see signs of a second Narendra Modi victory. What was submerged within voter consciousness is becoming apparent. Our coastal states speak Bengali, Odiya, Telegu, Tamil, Malayalam, Kannadiga, Marathi or Gujarati; the Hindi heartland lives alongside rivers and mountains. The term in Hindi for the same phenomenon is ‘hawa’ or wind. When the wind sweeps in, you know which way it is blowing, but no is ever sure where it rose. It is now common to attribute the ‘hawa’ for Narendra Modi to the daring air strike at Balakot. But while it energised support for Modi, there are equally substantive reasons for Modi’s appeal. Security has an economic dimension as well. The poor want food security, through low inflation and unhindered supply. They want roof security, and banking security of the kind that the middle and upper classes take for granted. Everyone wants life, health and job security, possible only through government schemes and high growth. The first decision Narendra Modi made, upon being elected, was historic in concept and radical in implementation. He made elimination of poverty the central objective of his economic philosophy. The operative word was ‘elimination’. He knew he was setting the bar higher than anyone else; then he raised it further. He wrote a date upon this horizon: 2022. Not too many people are aware of this, but “poverty alleviation” is a Constitutional obligation. But even a decade after Jawaharlal Nehru’s death in 1964, India was still in the throes of mass hunger. Nehru’s recipe was a pale form of socialism. However persuasive in theory, in practice it degenerated into stagnation. The marginalized poor, lost in despair, fuelled by rage, began in the 1960s and 1970s to veer towards Naxalism. Lal Bahadur Shastri’s term was too short, but he did energize the farm sector in an effort to raise food production. His successor, Mrs Indira Gandhi, recognized the dangers, and turned the accelerating crisis into a brilliant electoral bait in the 1971 elections. But her pseudo-socialism, with its leftist patrons, drove the country into a rut. Within two years of her stunning victory, there was massive discontent. In 1975 she locked India into an Emergency prison, and was defeated in 1977. When she campaigned for re-election in the winter of 1979-80, she shifted her theme to stability and national unity. Poverty should also be measured by expectations. Every generation expects more. This is as it should be. The poor are not foolish; they do not think that their hut is going to be replaced by a palace. But they have every right to demand that the roof must change from thatch to brick; their diet increase from two chapatis to four; their children receive an education that can open the door to aspiration. By 2014 at least 400 million Indians were living below what I call the “anger line”. Modi heard something no one else did. These 400 million were asking a question: if it took over six decades to bring the “anger line” from 70 to 30 percent, would it take another 50 to bring it to zero? They did not have 50 years to waste. He switched the pace from alleviation to elimination, adding a deadline, 2022. Then came radical moves. Modi decided to trust the poor with the latest technology. Aadhar and Jana Dhan, through which 300 million new bank accounts were opened, became the foundation of economic empowerment. Narendra Modi opted for pragmatic solutions instead of static ideology. He knew change had to be visible and meaningful. He took electricity to every village; equally, through LED bulbs he increased the power of light. These seem small only if you take a surplus of electricity for granted. There are about 100 such schemes for the forgotten. PM Modi is able to campaign on the assurance that the impossible will be possible only because he has done precisely this in his first five years. There was one subversive problem. Radical change can incite class friction. Modi wanted transition with harmony. He took an extremely unusual route. He appealed to the conscience of the better-off. In the most famous example, he asked those with extra gas cylinders to surrender them so that they could be given to the poor. It worked. The remarkable aspect of Modi’s communication strategy, was the evocative manner in which he personalised the harsh edges of poverty. In his 2014 speech from the Red Fort, he described the toxins plaguing a woman who had to wait till sunset for her toilet. He picked up the broom himself, and said that a clean India was possible only through a mass movement. the sum total of the Modi Experience is galvanising voters. The bookends are identification with the poor, and guardiansip of India’s security. Both fuse perfectly into the image of a Chowkidar. The symbolism could not be better. Congress leaders, unbelievably, are dismissing the Chowkidar with disdain. Congress has simply slipped away from the real world in which the Indians live. Rahul Gandhi looks like an appropriate President of a zoned-out party. One Congress ally, a leader of Sharad Pawar’s NCP, tweeted: “No Indian youth longs to be a Chowkidar. It is an insult to reduce our talented people to aim at so low as becoming a class four employee! A chowkidar is however a class four manual worker.” They don’t get it. Nerves, therefore, are getting frayed in top Congress echelons. At the moment of writing, Rahul is pondering whether even Amethi, the family constituency, is safe enough for him. In 2014, his majority was slashed by about two-thirds. A repeat performance would mean defeat. The Karnataka Congress President has written inviting him to contest from Karnataka. Such letters are not written without authorisation. This invitation arrived, however, before Rahul was welcomed by Bangalore bystanders very recently with a chorus of “Modi! Modi!” In UP Priyanka Gandhi was greeted with chants of “Modi! Modi!” There are no safe seats. Far from seeking seat adjustments, BSP leader Mayawati is saying she will put candidates against Congress. In Bihar, Laloo Prasad Yadav has issued an ultimatum: take eight seats out of 40. In Bengal, an understanding with the CPM has crashed. There are 184 seats in Bengal, Bihar, Jharkhand, UP and Uttarakhand. Congress will have effective candidates in barely a dozen. This election season began with talk of mahagathbandhan. Instead, we see a growing isolation of Congress. Mobashar Jawed Akbar is a leading Indian journalist and author. He is the Editor-in-Chief of The Sunday Guardian. He has also served as Editorial Director of India Today. 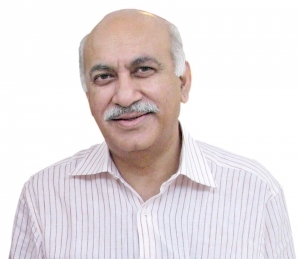 He tweets at: @mjakbar.